Now that we’ve tackled Basic Shorts….let’s give them a Flat Front. 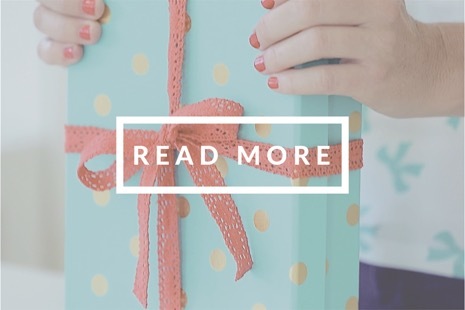 You can watch a video for this tutorial….Just click PLAY below! 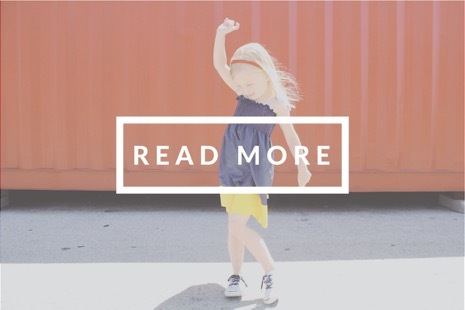 Or keep reading for more info…. 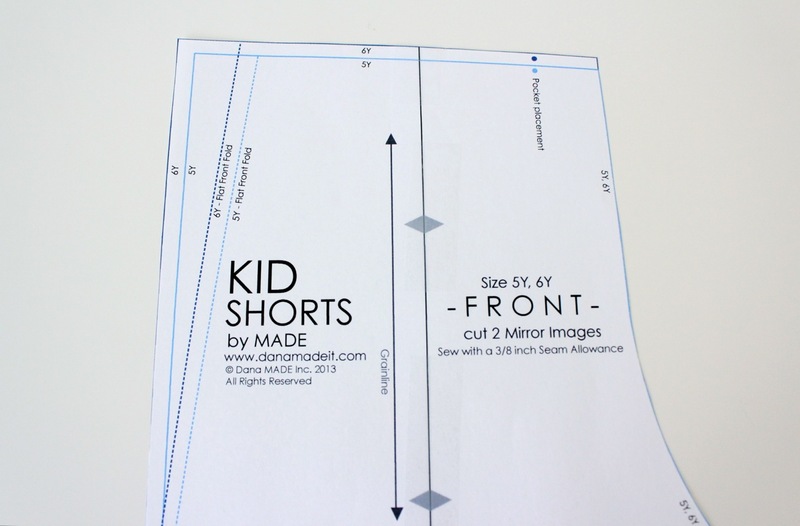 This post is one of many tutorials that accompany the KID Shorts PATTERN, which you can purchase HERE in the Shop. 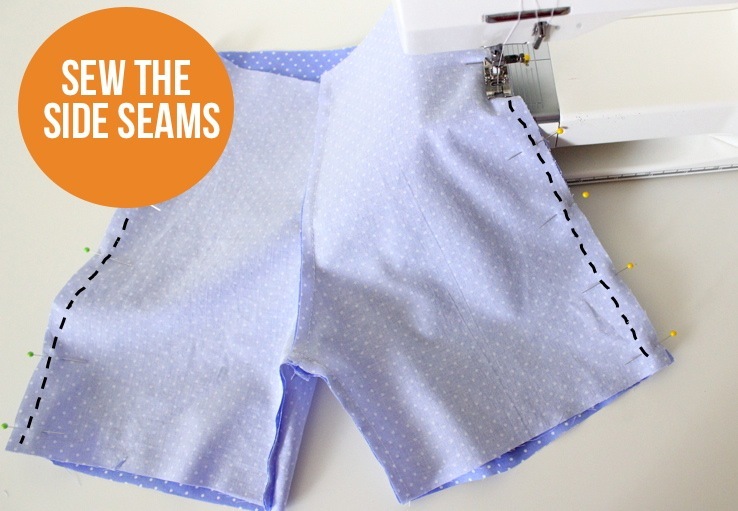 You do not need our pattern to sew these shorts but it’s recommended. 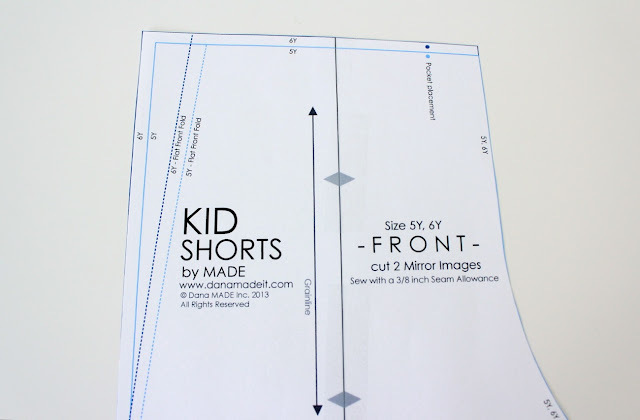 If you’re using a different pattern, or if you’ve created your own pattern, follow along with the instructions and make shorts with us! Flat front shorts are not hard to sew. 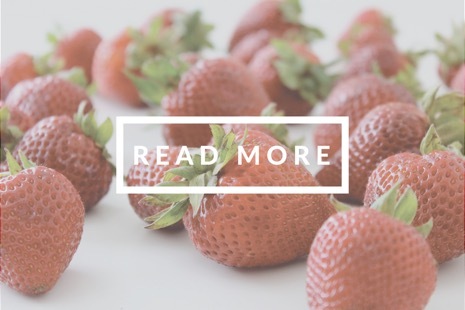 They might look like they are—cause the finished product is all awesome and professional looking—but we’re using many of the same steps to get a Short that looks really snazzy. 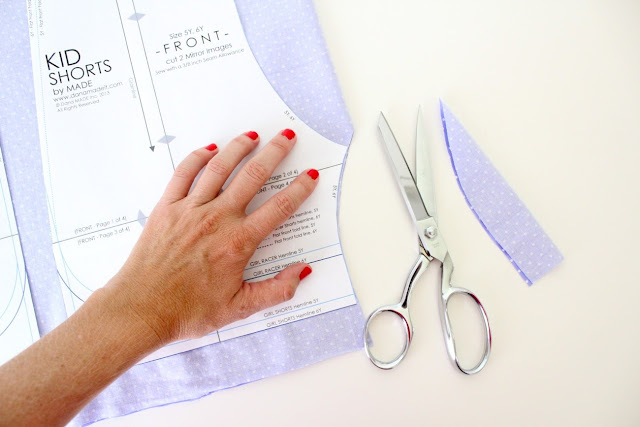 Basically all we’re doing is cutting the Front pattern piece a bit more narrow than before (which is easy to do with the Flat Front fold line on our trusty pattern). Then we’re adding elastic to the Back of the shorts only, rather than throughout the entire waistband. 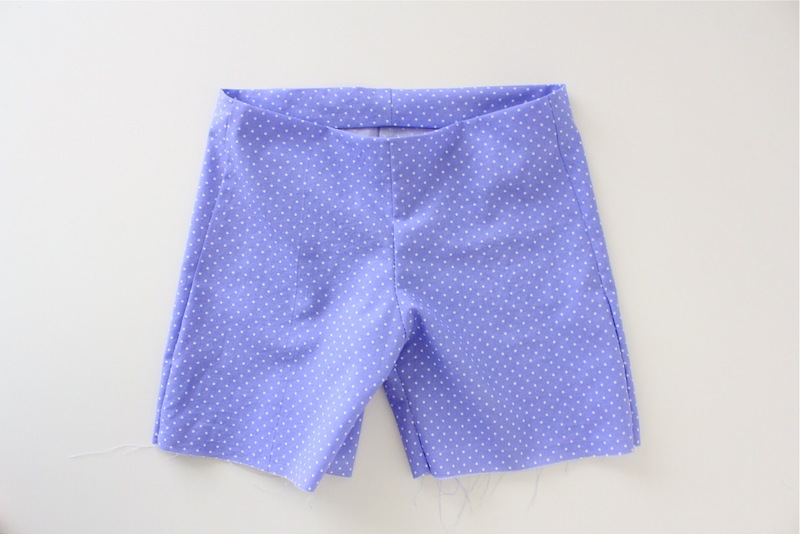 In reality, flat front shorts don’t take much longer to sew than Basic Shorts….and you end up with a more polished and professional look. It’s my favorite way to sew shorts for my kids. Grab your Front pattern piece and note the diagonal dotted line labeled “Flat Front Fold”. Simply fold the pattern under along that line (but don’t cut it so you can still use the pattern when making Basic Shorts ). And we’re ready to cut fabric. Fold the fabric in half, selvage to selvage and lay the pattern pieces parallel to the grainline (more info in the Basic Shorts tutorial). 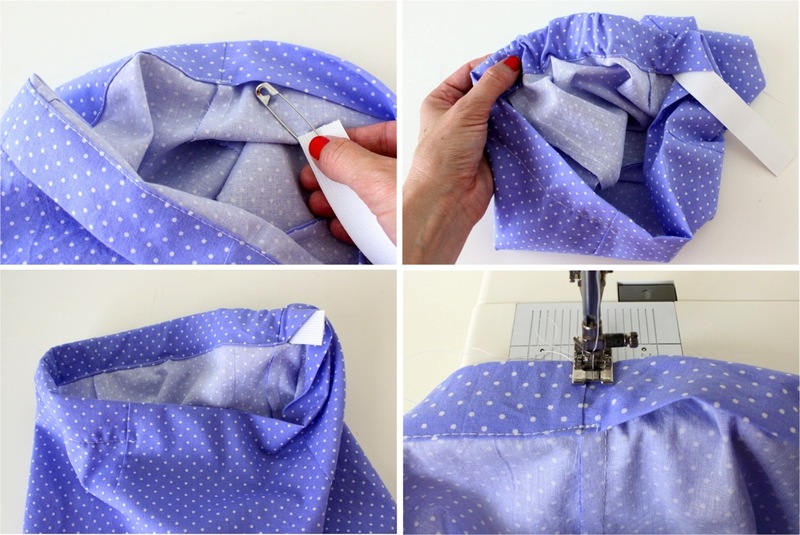 TIP #1: When folding the fabric, fold it with right sides together. Then once your patter pieces are cut, they’re already “right sides together” and totally ready to sew! TIP #2: When cutting out pieces you can trace around the pattern with a pen and then cut your pieces, or you can use some sort of weights to hold the pattern piece in place while you cut, OR—what I do—is to simply press down on the area I’m cutting with my left hand (using it as a “weight”) and then cut the fabric with my right hand. No tracing. And it’s surprisingly pretty accurate. Okay, you should have 2 Front pieces and 2 Back pieces. We’re going to start sewing the shorts the same way we did in the Basic Shorts tutorial (for fine details, read through that tutorial). You can tell that the Front is much more narrow than the back, which is perfect. Now pin the side seams together. 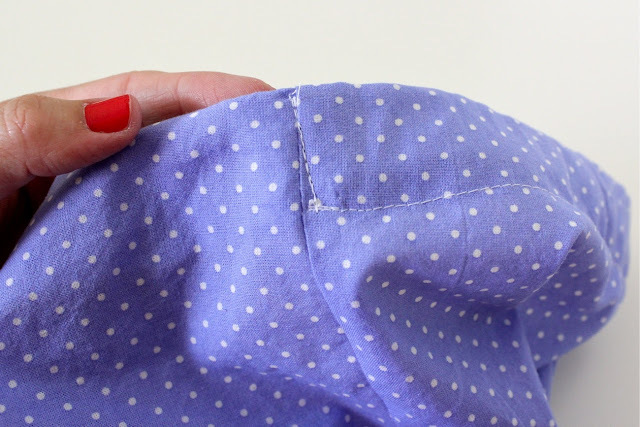 Pull the first side seam over so it reaches the Back side seam and pin, then pull the other side seam over and pin. Now create the waistband casing just as we did with the Basic Shorts. Iron it under a 1/2 inch, then iron it under another 1 1/4 inches. Now because the flat front pattern piece was slightly angled when we cut it out, the waistband might not lay as flat as it did with the Basic shorts. So just do your best to iron the waistband in place when ironing the Front portion of the shorts. And the good news is…..there won’t be any elastic going through the Front. 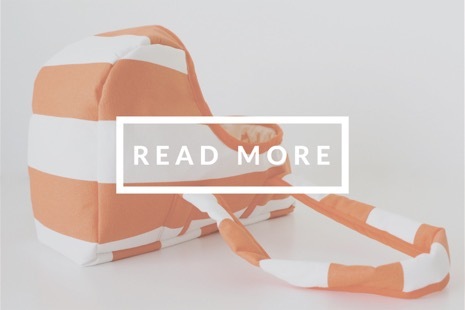 So the Front doesn’t need to be ironed under a perfect 1 1/4 inches to accommodate elastic. If some of the front is ironed under only 1 inch wide to help the fabric lay more flat, this is totally fine. Don’t get hung up on it, just do your best. Start at one side seam and sew the waistband in place—around the back of the shorts—over to the other side seam. And now it’s time for elastic! Reference the chart included in the pattern for the proper elastic amount. We’re using 1 inch wide elastic and I prefer Knit elastic (over Braid or Woven) because it tends to not roll up inside of the waistband over time. Attach a safety pin to one end of the elastic and start stringing it through the waistband. Enter through one opening at the side seam and push the elastic through till you have only a small tail of elastic sticking out at the first opening. 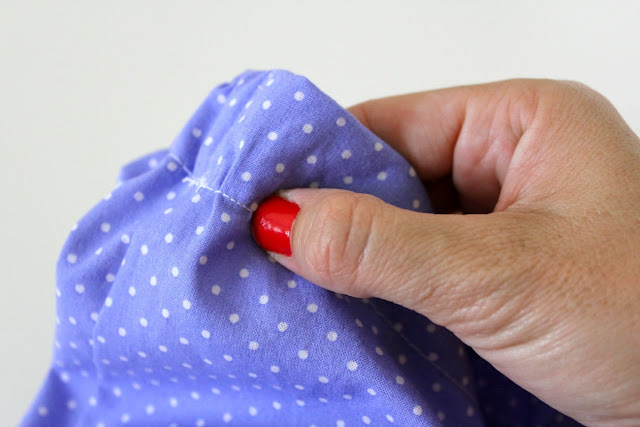 This doesn’t need to be exact (and try not to pull it too far or you’ll have to start over)….but when there’s about a 1/2 inch of elastic left at the opening, sew that end in place. I keep it real simple in this step. Simply sew down the waistband, right along the side seam, sewing the elastic and fabric together (see bottom right photo). With the elastic sewn to one side of the shorts, continue pulling it through the back till it comes out the other side-seam opening. Let the elastic hang out about a 1/2 inch and sew it in place, just as we did above. 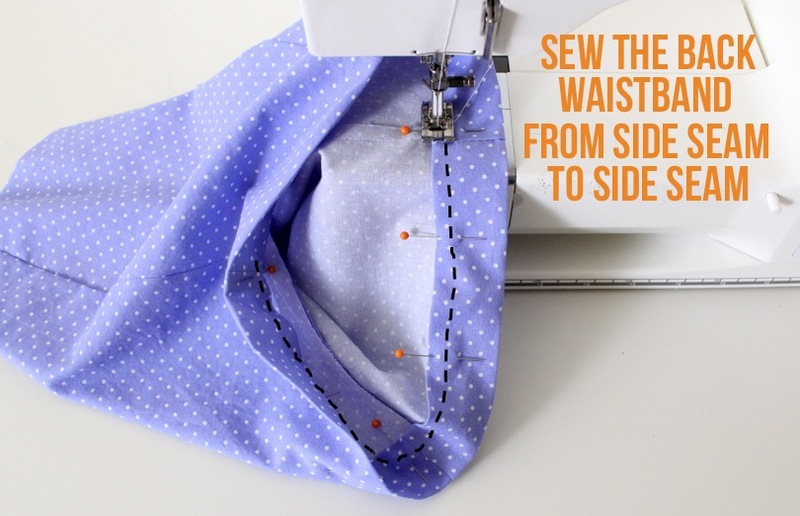 Trim the ends of the elastic so they don’t poke into your waistband. Now I should note that with that with this style of shorts….you could also make these shorts into an adjustable waistband by adding two buttons on the inside of the front waistband, and using elastic with buttonholes sewn in (you can purchase that type of elastic in many fabric shops, or even make your own). In all honesty, these shorts are so easy to make that I personally don’t think it’s worth the time to make an adjustable waist and I don’t think it looks as nice either. 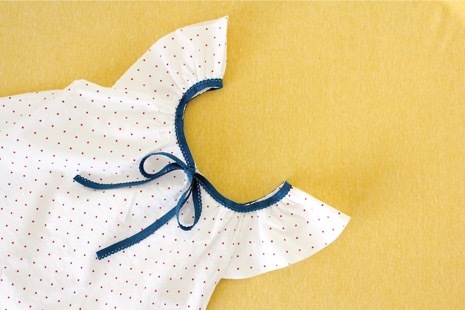 The beauty of sewing for your child is that you can make clothing to fit their particular body size. So, in my opinion, forgo an adjustable waist and simply sew a new pair of awesome flat front shorts if they grow out of them! Let’s sew the Front of the waistband in place! Now, I’ve tried doing this a few different ways. First is to pin the waistband down and then sew it in place. The pinning is fairly easy to do because we already ironed it down in previous steps. 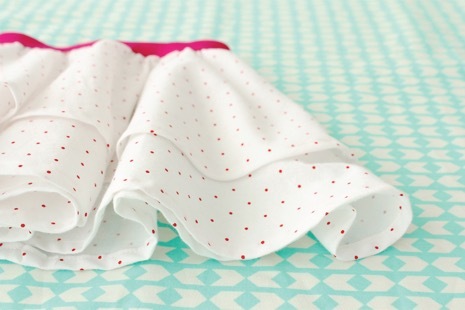 However, when sewing, you’ll sometimes end up with small bunches of fabric folds in your waistband. You can solve some of this by working out the kinks with your fingernail afterward (just scratch the seam and try to smooth it out). Or, when sewing, you might try sewing on the right side of the fabric, rather than the inside of the waistband, to watch for any pleating. But what I’m finding works best is to NOT pin the waistband down, to start sewing, and as I sew, continually pull the fabric slightly to the left and either up or down (depending on where I am on the waistband. I do this with my left hand, to get it as smooth as I can underneath the waistband. I use my right hand to hold the shorts and feed it through the machine. 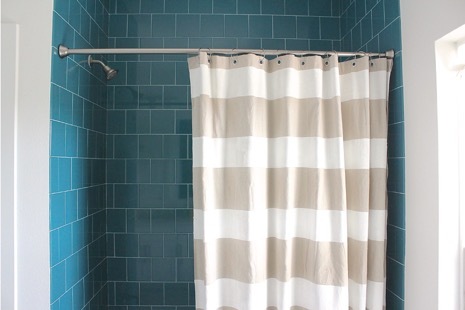 This distributes any small bits of excess fabric throughout the Flat Front. 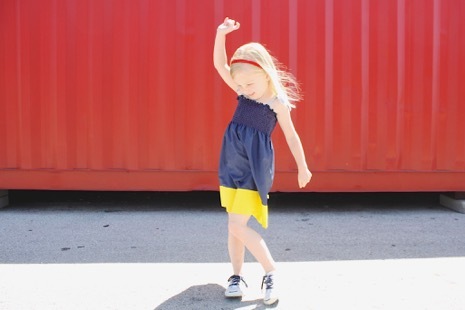 And you can see on this yellow pair of short below, there are a few small “gathers” but overall it looks great and in reality, once your kiddo has her shirt and shoes on….no one will even notice such minor imperfections. 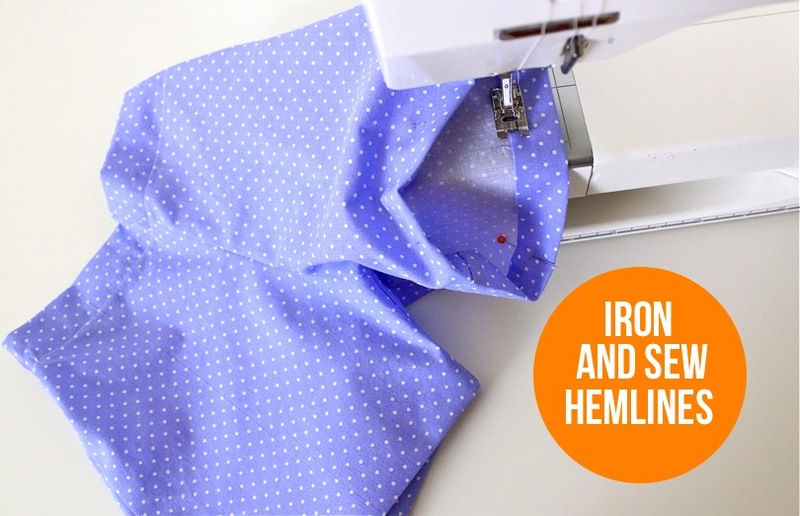 Iron the hemlines under a 1/2 inch and then another 1 inch and sew them in place. 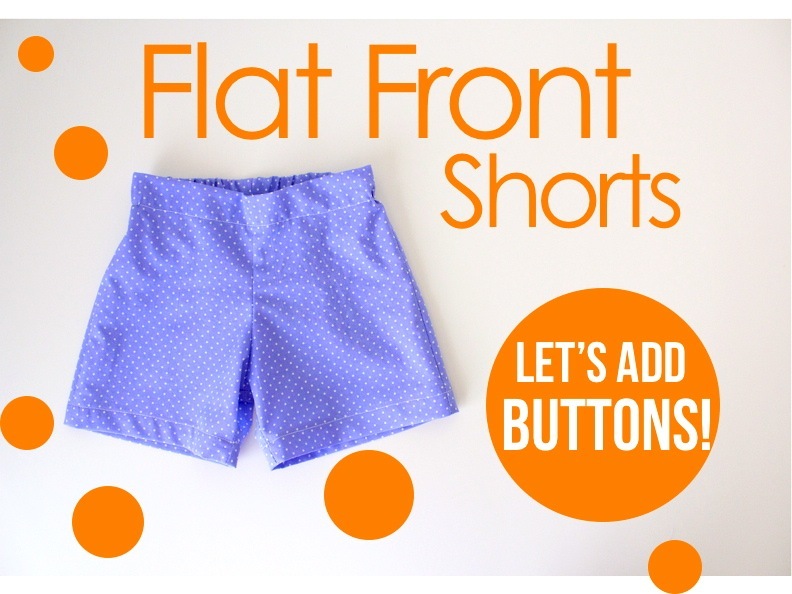 And…you’ve got an adorable pair of Flat Front shorts! You could stop right there. But for this girly pair let’s add some buttons….just for fun. The buttons here serve no purpose, other than looking cute. 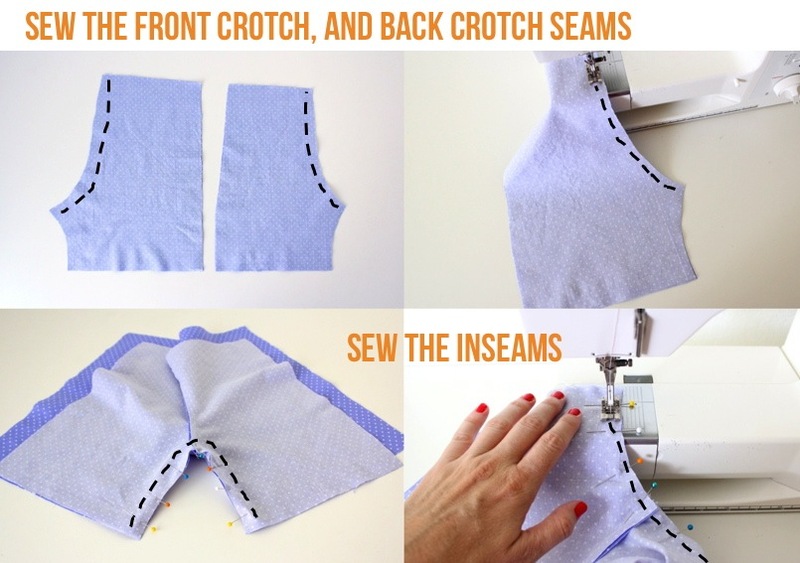 So no need to sew buttonholes. 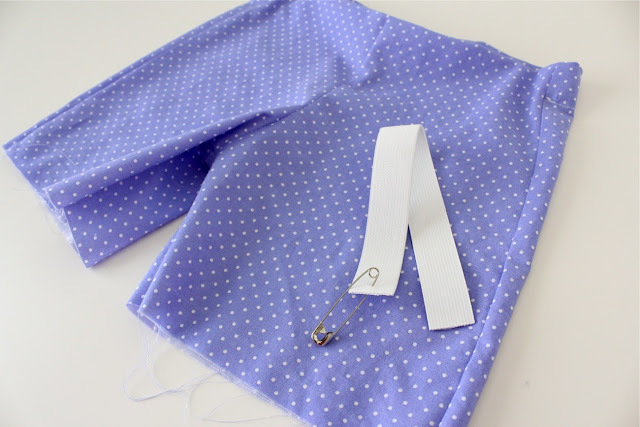 Simply find two buttons you like, center them on the front waistband and handsew them right to the fabric. 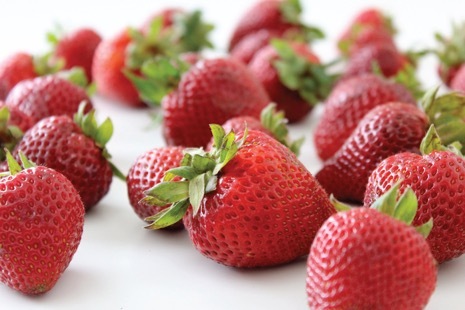 Then pair it with a colorful shirt and shoes and you’re ready to hit the boardwalk! 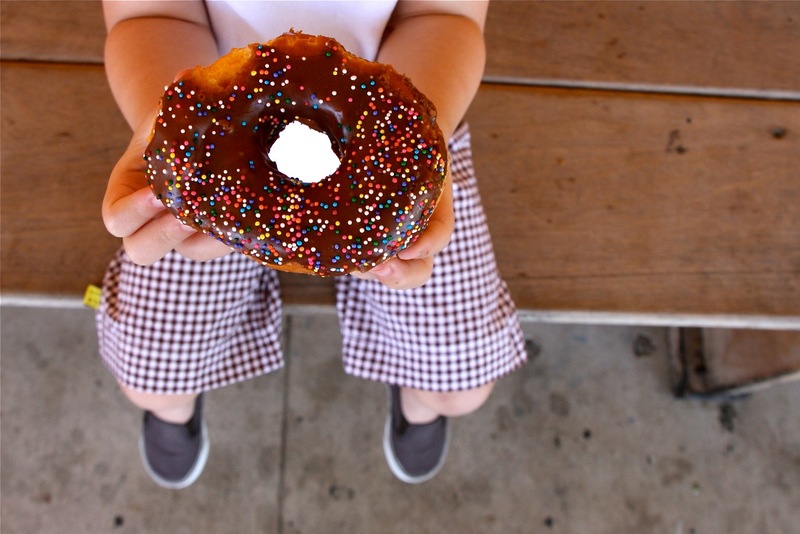 Hopefully your boardwalk tastes like this…. Come back on Monday for our next tutorial….we’ll be making RACERs! Adorable as ever! Those buttons are the PERFECT touch! Love it! dear lord… the cuteness is killing me! I with Delia– I love the buttons. So all the kids’ outfits are adorable of course, but Lucy’s shorts with the buttons… That whole outfit is out of the park cuteness!!! I just made a pair of flat fronts for my 3-year-old and they turned out seriously cute! Thanks for the awesome pattern and tutorials! Hi Dana, with the inside seams should they be overlocked? Will they fray? You don’t need to finish off the seams unless you’d like to. 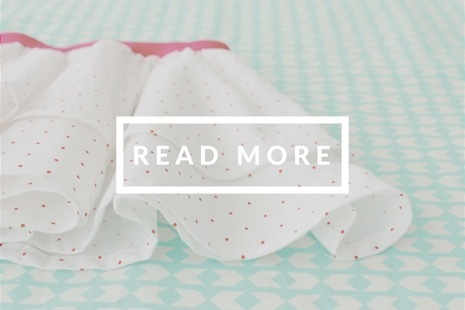 Yes, depending on the type of fabric you’re using, the seam edges will fray over time and with washing. Woven fabrics will always fray (knit fabrics will not), but depending on how tight the weave is, some fabrics will fray more than others. 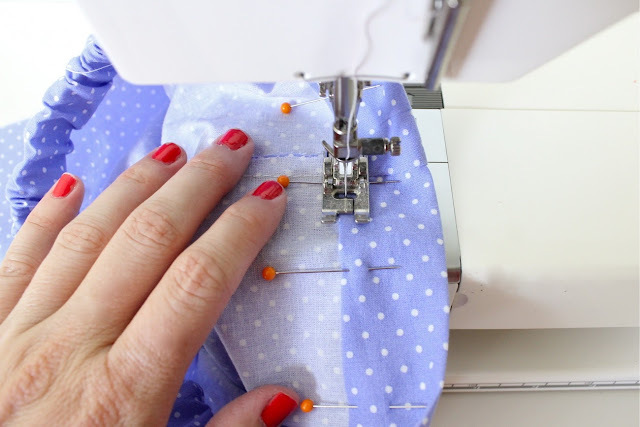 • Trim the edges of your seams with pinking shears (those zigzag scissors). Typically I finish off my seams with a serger. But while creating this pattern, I purposely did not use a serger, nor did I finish off my seams on about 15 pairs of shorts that I sewed for my kids. I did this so I could create them just as the average beginner sewer would be making them. And honestly, as the kids have worn them and as I’ve washed them, the seams are totally great….very little fraying. I may stop using my serger! 🙂 The waistband and the hems on each leg are finished off nicely (with the way that we’ve ironed under twice) which I think really helps hold everything together well. Thanks very much, I think i will sew first as you suggested and then serge. Love them, and why does Lucy look 13?? As soon as I saw this post I bought the pattern. Your earlier pants tutorial and pattern are what taught me (after being a confirmed pantophobe) that I not only COULD sew a pair of pants (from a pattern!) but that I might actually enjoy it. I already have a stack of fabric set aside to sew Wub three or four pairs of shorts this weekend. Thanks so much for the great tutorials. I just googled pantophobe and it means “Fear of everything.” Not exactly what I meant but you get my drift. Would this be too much of a challenge for a rather new sewer? Not at all. It’s much easier to figure out than it probably seems. I would definitely sew a pair of Basic Shorts first though, and then move on to the Flat Front. This and others I’ve seen of your works are really lovely. Thank you so very much!!! God bless your beautiful sharing heart. I’m new to sewing and I found these shorts so simple and so adorable, thanks so much I have a few of your patterns now I just love them!!!! I’m keen to make some of these shorts, but I’ve had a bit of a problem with the flat fronted pants, and I’m wondering if you can help? As the back sits higher than the front, when it comes to ironing the waist band under, I always end up with a funny kind of a crease/fold over where the front and back seams meet. Does this make sense? Is there a little tip you can give me so I don’t get this? Thanks heaps! I’m sure Dana will reply but I just wanted to say I’ve made lots of Dana’s pants with the flat front and after you’ve ironed down the casing and stitched the elastic into the back, it should be ok. You just need to give it a good iron and really smooth it with your fingers. Good luck. 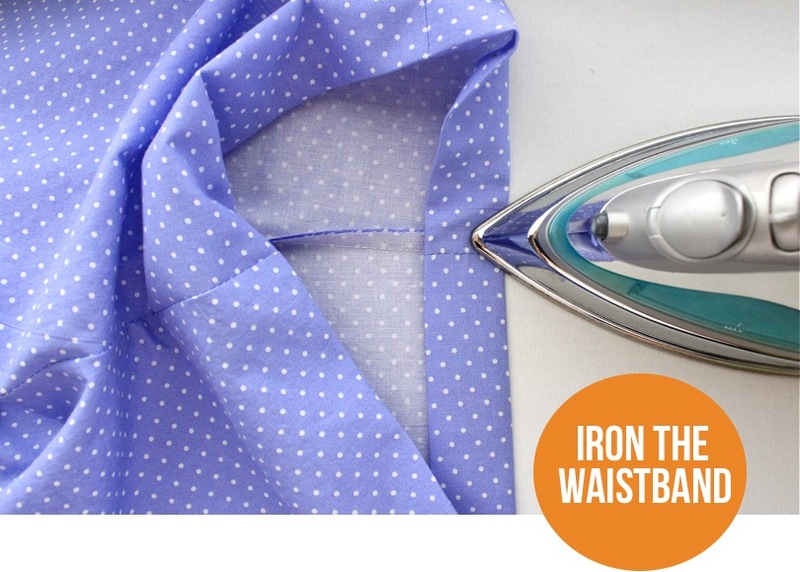 And yes, once you iron, the flat front will lay more smoothly. The other thing I do when sewing is to sort of pull the fabric slightly “up” with my left hand so that’s it’s evenly distributed as I sew. I’m sure that doesn’t make any sense when you’re reading this but try it out as you sew and see if that helps. I just bought the shorts pattern and I can’t wait to make some. 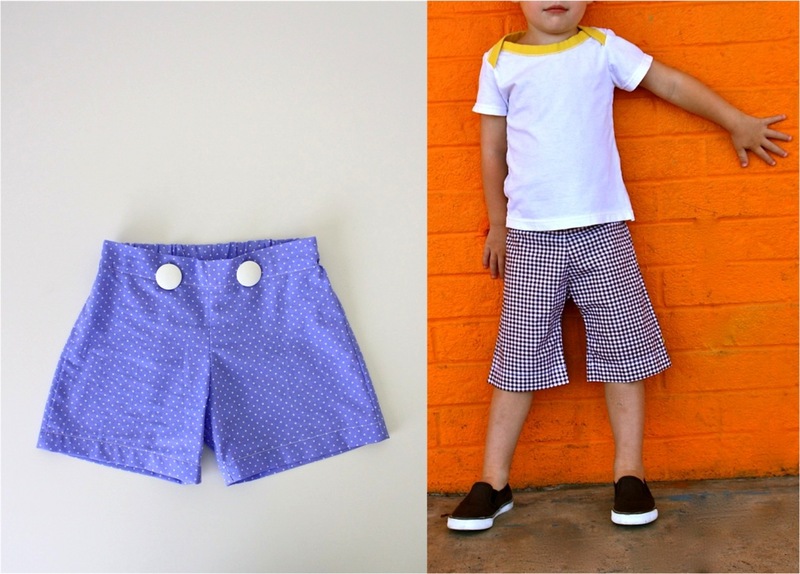 I have used your pants pattern quite a lot to make basic and flat front pants for my daughter and son and I just love the shape of them. I used that pattern to make shorts in size 3 and 4 but having this new pattern is great as I’ll have so many sizes and won’t have to guess when adjusting the pants pattern to make another size. Are you planning to do the same for the pants pattern, ie. 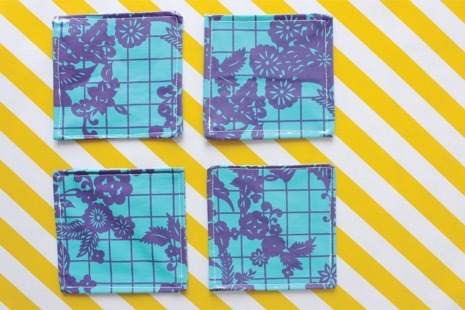 sell a printable pattern in different sizes? Hi Monique. yep! I’m planning to do a tutorial about extending the shorts pattern down to pants. Just haven’t done it yet! but it’s high on my list! I have just whipped up a pair of shirts for my son after buying your pattern! He wears modern cloth diapers which are pretty slim gutting but I think the shorts need a tad more room – what seam would you recommend adding a bit more to? 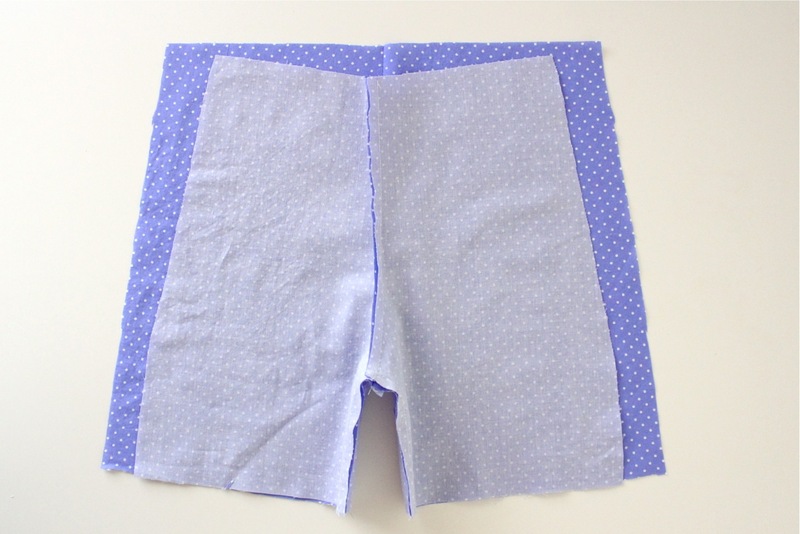 I made up the 18mth size which fits perfectly around the waist and is good in length (and width) of the short. Oh my gosh auto correct kill me now! Shirts obviously = shorts and his diapers are slim fitting! I made the size 18 months too for my 14 month old but I’ve found them to be too snug in the hip area. The length is great and the leg width is fine but with a diaper underneath they are a bit snug around his hips/bottom. I’ll have to make them bigger next time. 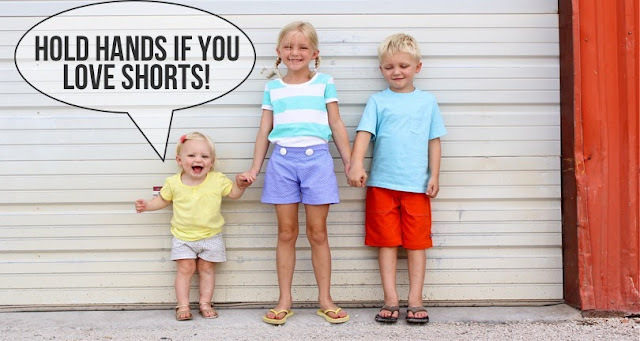 The shorts sizes work well with disposable diapers but if you’re using cloth diapers, I recommend going up a size, while still using the same elastic size for your child’s wasit. If you still need more room than that, you can even go up another size, but shorten the hemline on the legs. Imprimez échelle 100% et c’est tout bon! Facile de suivre avec les images du tuto sans être bilingue. j’ai allongé le patron pour faire des pantalons. Super! Remarque: basez vous sur les mesures données et non les âges. Sline, très contente d’avoir acheté ce patron. OHMYLAWD!!! 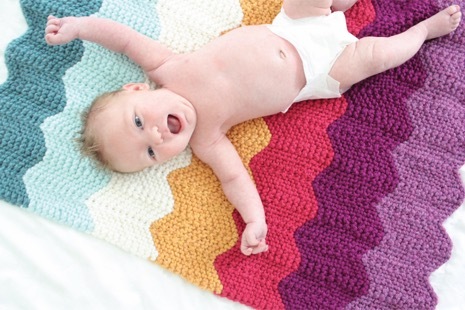 I am in L♥ve with this pattern!! I am a beginner sewer and was put onto your AMAZING site by a sewing group. 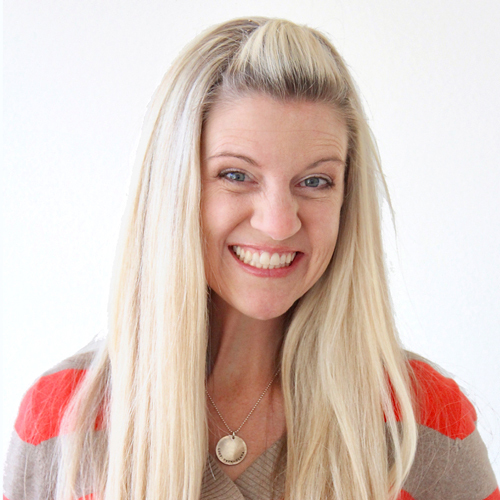 Thank you Dana for making it easy for me to create gorgeousness for my son and daughter. I made my FIRST EVER pair of flat front shorts tonight and have not had to unpick anything with your easy as tutorial and pattern. 🙂 Super happy with how they have turned out. I love these shorts! Have you ever put elastic in the legs to make them more of a type of knickers? Would the legs be long enough for that? Such a wonderful pattern! I’ve made my first ever pair of shorts today and it was easy peasy. My trouble is that I have a 20 month old with chunky thighs. I made the size 2 shorts which have the right sizing for her waist but I have no hope of getting them over her hips! So my question is, am I better off making a larger size that will fit her hips and it will just bunch up more around her waist, or just extend the 2 year old pattern? Sorry you had some probs with the hips. 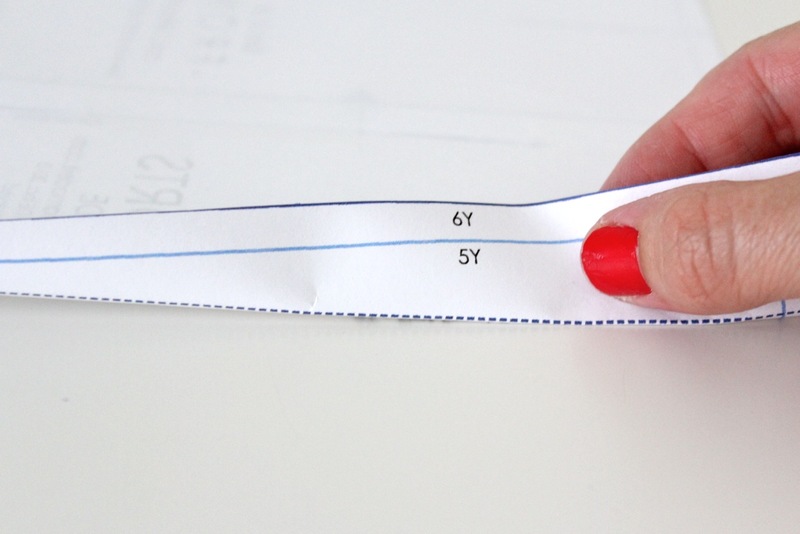 I would either add more width at the side pattern pieces…..or yes, go up to the size 3 and keep the elastic as you had it for size 2. So I used this pattern and elongated the legs to make a pair of pants for my 4 year old…I made him a size six because he is super tall and slender, but when I finished them, they fit, but have more of a “girlish” tighter fit to them. My question is, do you think I could not use the flat front fold and still make them flat front to get a little more room for him or should I just size up and keep the flat front fold? You can definitely go up a size but keep the size of your elastic the same. 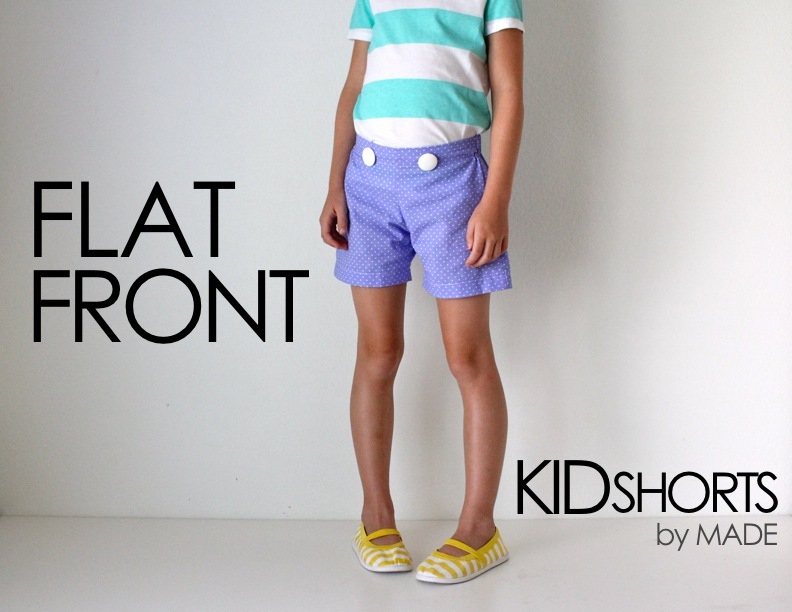 I use the flat front shorts for my son all the time. They’re not meant to be baggy sports type shorts, they are definitely a more fitted short. 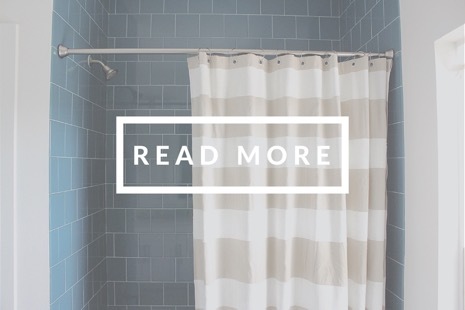 But if you’d like more room in them, then yes, the next size up should work. 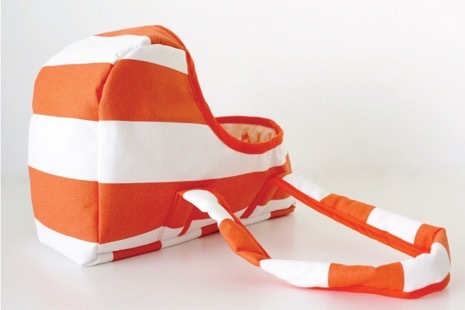 Also, do you have plans to add a tutorial to add interior instead of exterior pockets? I would love to see one! Maybe with a mock fly too! I think I bought this pattern the day it came out. 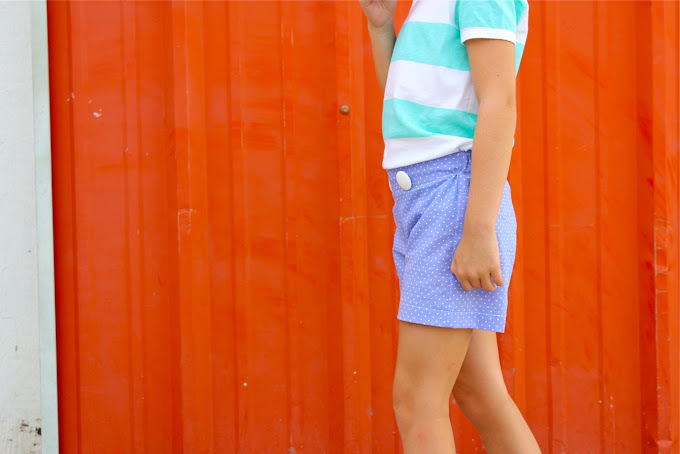 It is the perfect easy shorts pattern and if you lengthen the hemline is even suitable for school uniform shorts. 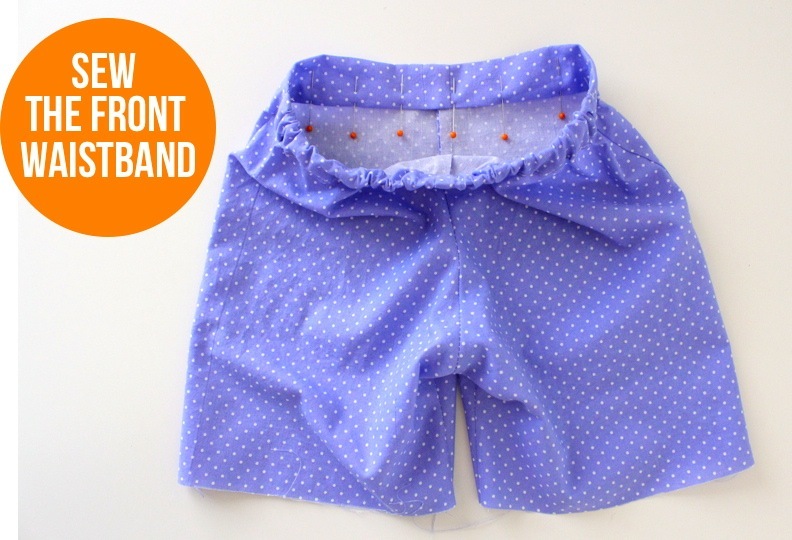 With it being Kids Clothes Week I knew I wanted to make Wub at least one pair of KID shorts. I added a large bow to the front and I love the way it turned out. I’m actually making another pair for her tomorrow. Love, love, love this pattern. Cannot recommend it enough. I have just finished the girls flat front shorts and they look great, thank you Dana, moving on to shorts for my son now. Fantastic pattern, thanks Dana! 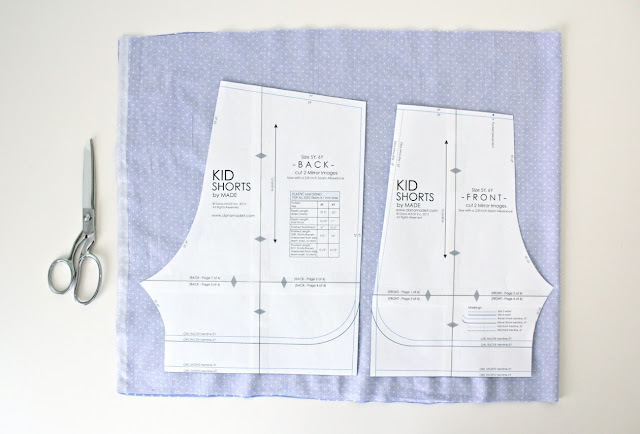 I have used it to make the racer shorts for my super tall but slender to average sized 6 year old son in the size 9/10 based on the waist measurements. I am wanting to make him & my nephew some more but will need to draft the sizing up first to make sure they get the wear out of them. I have a problem I was hoping you could help me with please? I have also just finished a pair of flat front pants (with both front and back pockets which are both trimmed) for my very tall, almost 4 year old daughter in a lightweight stretch denim using the size 7 shorts pattern and basically just lengthening it as I had been so happy with the fit of the shorts on my son. I am happy with the loose fit through the leg. My problem is although I choose the pattern size based on the waist measurements on the pattern, the pants seem to be too baggy in the front around the pocket and crotch area. Can you suggest a way to lessen this excess in future pairs I make for her? Should I just fold in the flat front piece more to accommodate for this? I realised she would have a bit of room in them when I was making them and have made the waist adjustable with buttonhole elastic which has turned out really well. Hope you can help as I would like to make her some more soon! Help! I’m having major issues with the elastics… I’m making a bunch of these for birthday party favors for my son’s party. I have made the proper sized pants… even gotten waist sizes for each kid. 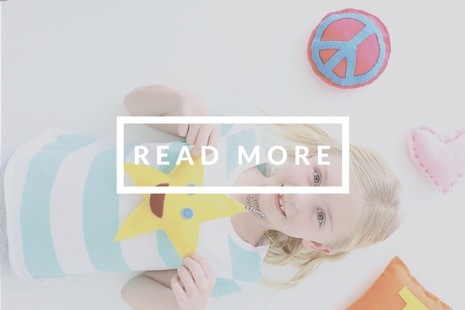 When I use your guide for the elastic for the flat front (half the child’s waist size, plus 1/2-1 inch extra), when I finish them up, they barely stretch at all. When they just lay flat, there’s barely any gathering of the elastic waist at tehe back (looks a little less gathered than the pics you posted with your daughter’s pair). I am using organic cotton twill. When I pull them taught, the elastic stretches 3/4 of an inch to 1 inch. I’m using braided elastic- does that make a difference? Am I doing something wrong? 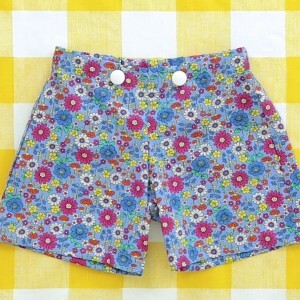 I just whipped up a pair of the flat front shorts for my grand daughter who is a big 5yr old. I chose size 8 and they are way to small. She fits into other size 8 patterns…….I am so disappointed! Love the pattern and will print out the size 10 for the next pair. i not even sure these will fit a 3yr old…….What did I do wrong? 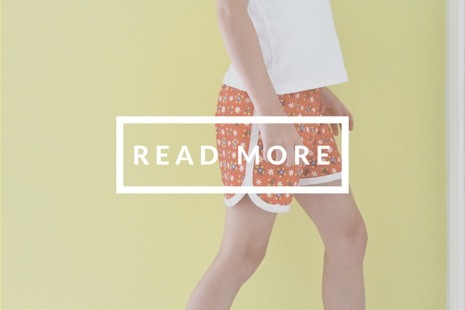 I’m not sure how I found your site but I was looking at some other clothing and thinking I would like some shorts a bit more stylish than just elastic waisted for my 6 year old granddaughter…. then some somehow up came your site. The flat fronted shorts are just perfect for when they want something a bit more grown up. I’ll be sewing these tonight.. Thankyou so much. I noticed the elastic for the flat front shorts is different where it is printed on the pattern piece (10.75) than in the instructions (11.5). My 5yr old daughter has a 20″ waist but is tall. Id planned to cut the 5year old with the elastic 10.5? This pattern is awesome. It’s perfect for my little one. My older girl, though, is tall and slender with a bigger than average booty, and I’m trying to think through how to modify the pattern to keep everything the same except give her more room in the seat area. 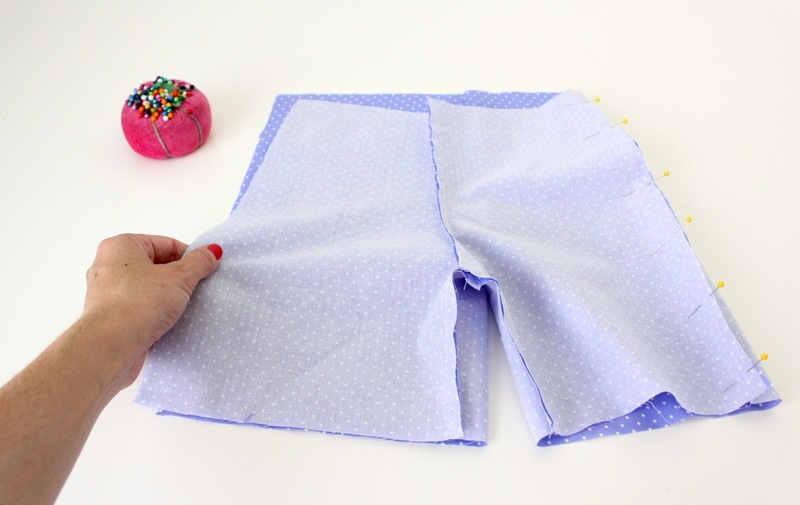 I’m also wondering how to increase the pattern to make a pair of these shorts for my 14 year old niece. 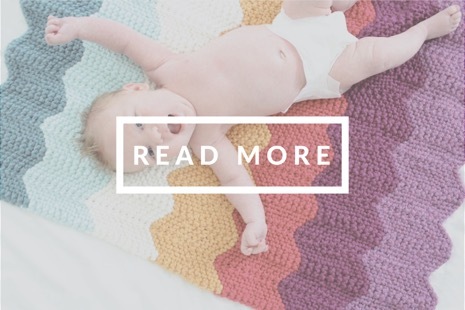 I bet it’s all super easy – I’m just a novice still. I’d love advice on how to go about it. Thank you! Do these tend to run a bit small? I made the flat front in size 18mo for my son who wears size 18mo clothes, They wouldn’t even go up over his legs. Once I looked at the size chart, his waist is 18.5 inches, so I should have done 2T, but because they didn’t even go up over his legs, I’m wondering I should make 3T. Any Input? Hi Victoria…some people have mentioned that they run on the small side, for their children, but you should definitely be able to get it up the legs. 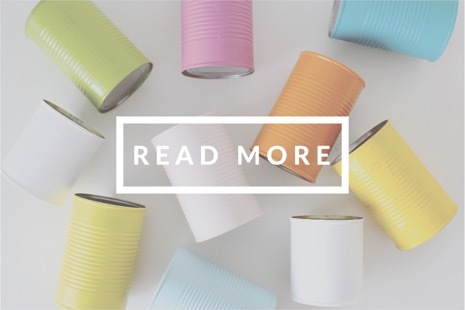 You can always bump up to the next size and use less elastic in the waist. I actually prefer making them a little “bigger” on my kids, so they can wear them longer. 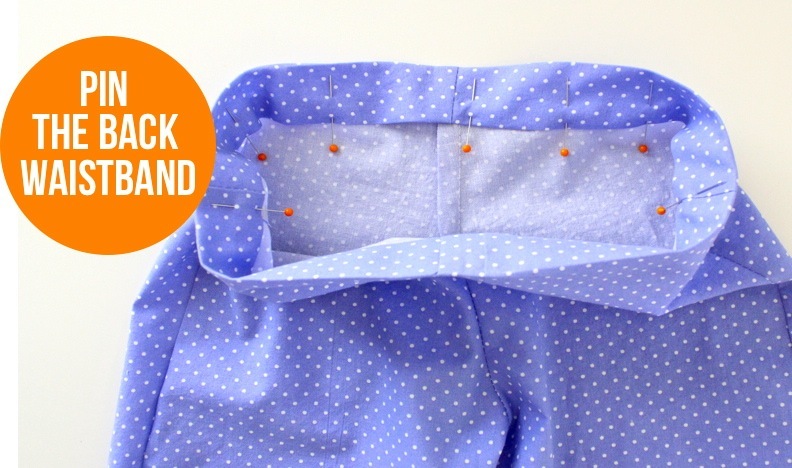 The good news is…shorts are a quick sew and take small amounts of fabric! So it’s great to keep playing with the pattern till you find what works for your kiddos. I bought the patern and are excellent! My size 14-16 daughter would love these shorts, but your pattern doesn’t include that size as it only goes up to 10. We’re struggling to find shorts that fit her long legs, so I’m hoping somehow to get the pattern from you for that size so I can get my girl some summer shorts! Sorry this is as high as our pattern goes, to make them fit properly for kids. As girls get older, you have to account for more hip curves, and more defined waist, etc. So I would look into finding a women’s shorts pattern!…and using the smallest size they offer (of course it’s best to look at the sizing info on their pattern). 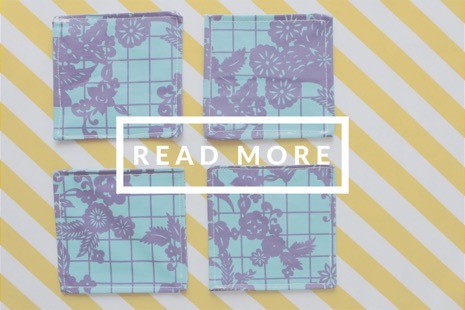 Check out: Blank Slate Patterns, Colette Patterns, Grainline Studio …and then just check in the patterns at Jo-Ann Fabrics. Sometimes those basic patterns are great! Im new to sewing but made your zip bags for Christmas gifts this year… went down a storm. My question, is the 3/8 seem allowance taken into account in the pattern? Or should this be added? Yes. The seam allowance is already included in all my patterns. You don’t need to add anything in!